To put our tasting in historical perspective, let’s think that in 1870, Hong Kong had a population of 130,000 residents and it was six years before the telephone was invented. 1928 was the year when the first airplane landed in Hong Kong, two years after the first movie with sound track was ever produced. 1953 saw the first man reach the Mount Everest Summit and it was 1 year before the first color TV was introduced. In 1961, Hong Kong’s population had reached 3.13 million and it was one year before its Kai Tak Airport opened. In 2003, Hong Kong’s population reached 6.9 million and China sent its first human spaceglight in orbit. That all of the wines included in this tasting survived those eras in such a beautifully drinkable way was extraordinary. Visiting Chateau Cos d’Estournel is an exotic experience for the Chateau itself is a fascinating collection of architectural styles reminiscent of the Orient in so many aspects. With its padogas and bells ressembling a Chinese temple, with its elephants guarding the entrance and its meticulously carved wooden panels from Zanzibar, it is not surprising that Louis-Gaspard d’Estournel, its founder, was once called “the marahajah of Saint-Estèphe”. Nevertheless, what set the tone of our extraordinary tasting was most likely its motto carved into its façade: “Semper Fidelis”. “Always Faitful”. This loyalty to perfection has been the guiding principle that has inspired his successors until now to give us wines that are powerful, pure, and renowned for their long ageing ability. 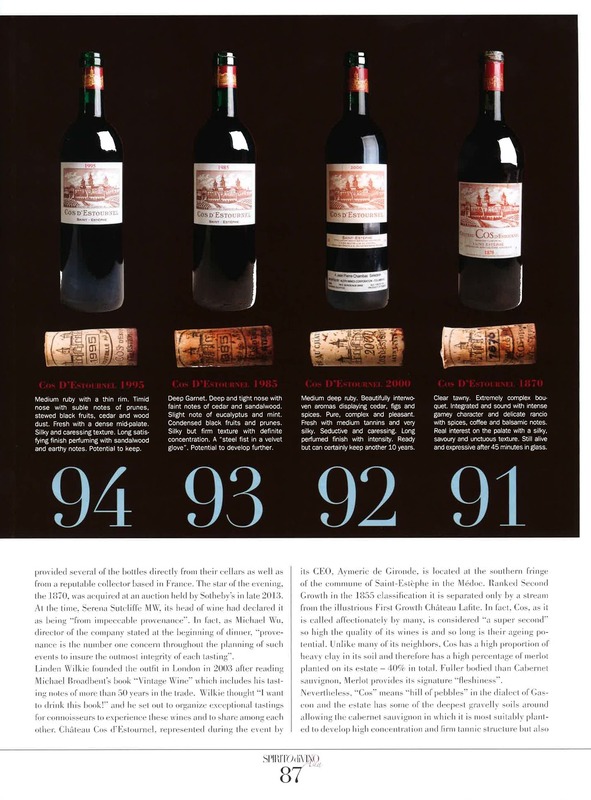 Certainly, our tasting clearly demonstrated that the wines of Chateau Cos d’Estournel can age not only over decades but also for more than a century. Organized by The Fine Wine Experience, a wine merchant and exceptional wine event curator, the tasting took one year to prepare. The wines were carefully sourced from three origins. The Chateau provided several of the bottles directly from their cellars as well as from a reputable collector based in France. The star of the evening, the 1870, was acquired at an auction held in London by Sotheby’s in late 2013. At the time, Serena Sutcliffe MW, the head of international wine department had declared the wine as being “from impeccable provenance”. 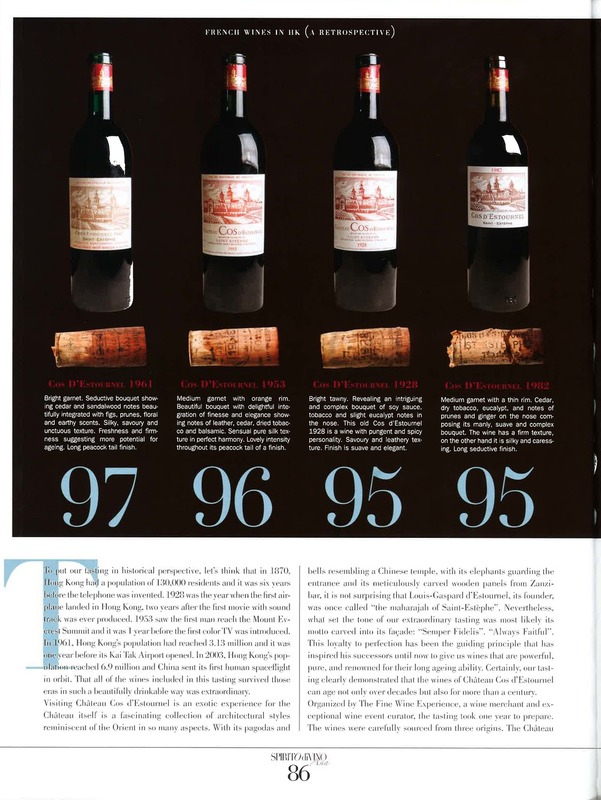 In fact, as Michael Wu, director of The Fine Wine Experience” stated at the beginning of dinner, “provenance is the number one concern throughout the planning of such events to insure the outmost integrity of each tasting”. Linden Wilkie founded the outfit in London in 2003 after reading Michael Broadbent’s book “Vintage Wine” which includes his tasting notes of more than 50 years in the trade. 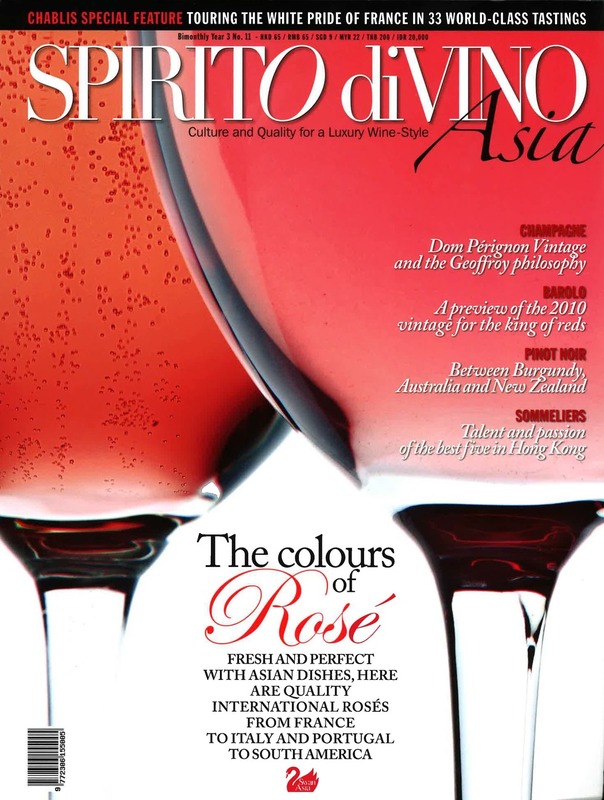 Wilkie thought “I want to drink this book!” And so, he set out to organize exceptional tastings for connoisseurs to let them experience these wines and to share among like-minded wine lovers. Chateau Cos d’Estournel, represented during the event by its CEO, Mr Aymeric de Gironde, is located at the southern fringe of the commune of Saint-Esphèphe in the Médoc. Ranked Second Growth in the 1855 classification it is separated only by a stream from the illustriuous First Growth Chateau Lafite. In fact, Cos, as it is called affectionaly by many, is considered “a super second” so high the quality of its wines is and so long is their ageing potential. Unlike many of its neighbors, Cos has a high proportion of heavy clay in its soil and therefore has a high percentage of merlot planted on its estate – 40 % in total. Fuller bodied than cabernet sauvignon, merlot provides its signature “fleshiness”. Nevertheless, “Cos” means “hill of pebbles” in the dialect of Gascon and the estate has some of the deepest gravelly soils around allowing the cabernet sauvignon in which it is most suitably planted to develop high concentration and firm tannic structure but also elegance and refinement all at once. As de Gironde stated, “it is the art of blending that brings the complexity to the wines”. The key for Cos, he continued, is “to achieve power with elegance”. Dinner proceed in various flights each organised to a theme based on expectations from previous tastings and critics descriptions. We soon found out that the wines defied not only time, but preconceptions as well. We started with 2005 and 2003 before dinner, as “amuse bouche”. It was the 2003 that provided the first surprise of the evening. We have all heard how hot the summer had been then. In fact we were told by de Gironde that the problem was not so much the extreme heat of daytime hours, but more so the warmth of each nights. Under these conditons, the vines do not have time to rest. And so, we expected the 2003 to be heavy. In fact, it was fresh, with a beautiful complexity, and nicely integrated tannins. Lovely now but certainly a beautiful wine to “forget” in the cellar for another 10 to 15 years. On this flight, we had the 2000, 1996 as well. But it was the 1985 which stood out with its firm backbone and silky texture. Clearly an “iron fist in a silk glove”. Our second flight included the 1961, 1949, and the 1870. As it was poured into our glass, a respectful silence descended upon the room and it was not without some trepidation that most us reached for it. Certainly, there was electricity in the air as each of us nosed the wine for the first time. The second surprise of the evening was that it was in excellent condition. The bouquet was fascinating with a very delicate complexity interwoven as the most intricate of tapestry. It was not madeirised or oxidised. Yet, it had an aroma that was unusual and never before scented. Slightly gamey or medicinal perhaps? Certainly the nose was pleasant and bewitching like a seductress from the Far-East... The palate was extraordinary with a sensously caressing unctousness. It stood still for some time. Impressively, after 45 minutes in the glass, it had not moved and remained faithful to itself as it had been on the first nose. A fascinating experience. The 61 was voted the best of the evening by the majority. Not surprisingly, it was issued from an exceptional vintage and impressively the wine showed that it still had much life into it. A classic and an absolute beauty!